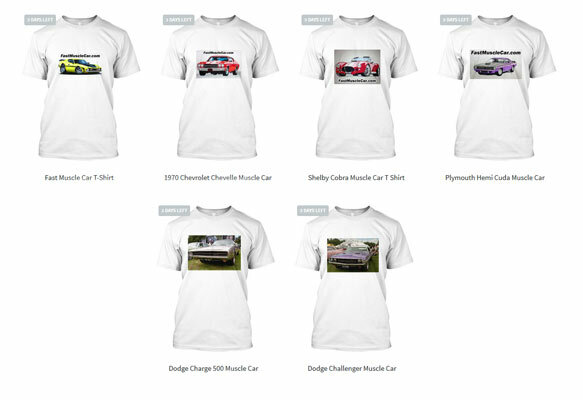 This is a total and utter unashamed plug of our new muscle car T-shirts which you can now buy from our Tee Spring shop. They’ve been put together by our wonderful designer Anthony Tarantino who will be bringing regular, new designs of your favorite muscle cars throughout the year. Currently we have a selection of musclecar T-shirts which we will be expanding on each week. Each T-shirt is professionally screenprinted in many different sizes and colors. Pick your favorite car color and show them off this summer. All the T-shirts will be screen printed, producing the best quality and longest lasting shirts, along with the best designs. Each shirt color reflects the color of the car, giving a seamless look to the shirt. Just check out the link below for the T-shirt shop and grab a few while stocks last.